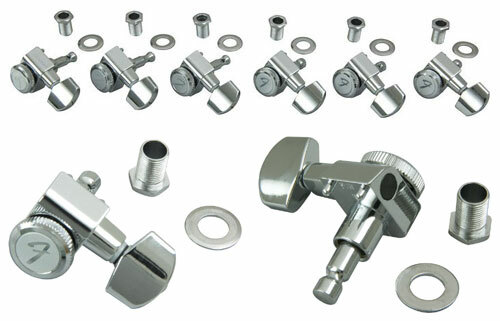 Genuine Fender® chrome locking tuners. Features staggered height tuning posts for optimum string angle at nut. 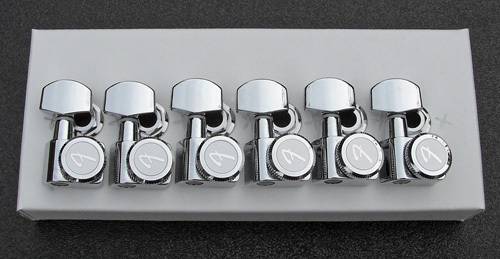 Each tuner keys locking knob has Fender's "F" logo. Tuning ratio 18:1. Lock your strings down at the tuners for maximum tuning stability. Complete set of 6. Includes bushings and washers. Requires 10mm holes in headstock. These are compatible with the American Standard, Deluxe, Elite and Professional Strat neck where there are two guide pins on each tuner. Manufactured in Taiwan.